After such a title, you probably expected something about a conversation with President of Poland, or something like this… Well, it’s about a Twitter conversation (if getting a reply for one tweet can be called a conversation) with… Paul Kagame, the President of Rwanda. I saw that he’s getting quite addicted to tweeting (and it even seems he’s writing himself, but I can’t be totally sure), so I asked him just one question. And he replied! Me: It’s >10 years since you’ve become a president. What do you feel was the greatest achievement during your presidency so far? Paul Kagame: Unity n progress in develpmnt n peace! Thank u ! His reply made me think about his opinion on these and other matters. Mr Kagame uses abbreviations in his posts to fit more information in 140 characters. If you want to ask any questions, feel free to contact him at his twitter account. Po takim tytule, zapewne spodziewaliście się czegoś o rozmowie z prezydentem Polski, albo czegoś podobnego… Cóż, ten post opisuje rozmowę (jeśli odpowiedź na jedno tweetnięcie można nazwać rozmową) z… Paulem Kagame, prezydentem Rwandy. Zauważyłem, że uzależnia się od Twittera (i nawet wygląda, że to on pisze, ale całkowicie pewien być nie mogę), więc zadałem mu jedno pytanie. Odpowiedział! Ja: Minęło >10 lat, od kiedy został pan prezydentem. Jak pan sądzi, co było jak dotąd największym pańskim osiągnięciem podczas sprawowania władzy? Paul Kagame: Jedność, postępy w rozwoju i pokój! Dziękuję! Jego odpowiedź wywołała u mnie sporo przemyśleń odnośnie jego zdania na powyższe i inne tematy. Pan Kagame używa skrótów w swoich postach, by zmieścić więcej informacji w 140 znakach. Jeśli chcesz zadać mu jakieś pytanie, napisz do niego na jego konto na Twitterze. Your car has to be made or designed in one of the Communist countries, when they were so. That means no new cars – the design is at least 20 years old, and some of the cars are much older than this. Its price should be less than 1000 Polish zlotys (about 253 Euro, $337, 218 British pounds or 27442 Japanese yen) – though you can invest more in refurbishing the car if you want. There are some guys that spend the whole year preparing the car, and some that bought a car last-minute. One thing would surely be useful – a CB Radio transceiver. You have to pay an entry fee of 200 zlotys (divide the sums above by 5), but you also have to find people or companies that pay at least 1000 zlotys for a Polish charity that supports orphanage kids. The rally always starts in Katowice, Poland. You pay for everything – camping (if you don’t want to sleep in the car), gas, repairs, or even transport back home in case of a total breakdown. This time, the rally will take place between July 23rd and July 27th and this year’s destination is Loch Ness, Scotland. Don’t be too surprised if a car like the one above overtakes you on German autobahn. This is how it looked in 2010, when over 120 teams tried to get to Istanbul, Turkey. I don’t think I’d be able to take part this time, but it sure is fun. Samochód musi być zbudowany lub zaprojektowany w jednym z krajów komunistycznych w czasie, gdy takim był. To oznacza, że nie można użyć nowego auta – design ma co najmniej 20 lat, a niektóre z samochodów są dużo starsze. Graniczną ceną samochodu jest kwota 1000 zł, ale można zainwestować więcej w renowację auta. Niektórzy uczestnicy spędzają cały rok przygotowując pojazd, a inni kupują go w ostatniej chwili. Jedna rzecz może być przydatna – stacja nadawczo-odbiorcza CB Radio. By wziać udział, należy zapłacić opłatę startową w wysokości 200 zł, ale także znaleźć sponsorów, którzy zapłacą co najmniej 1000 zł na wyznaczoną przez organizatorów fundację pomagającą dzieciom z domów dziecka. Rajd zaczyna się w Katowicach. Płacisz za wszystko sam – camping (jeśli nie chcesz spać w samochodzie), benzyna, naprawy, a nawet transport do domu, jeśli samochód rozsypie się po drodze. Tym razem, rajd odbędzie się pomiędzy 23 a 27 lipca, a celem podróży będzie jezioro Loch Ness w Szkocji. Nie zdziw się, jeśli auto takie, jak powyżej wyprzedzi Cię na niemieckiej autobahnie. Powyżej umieściłem też filmiki, jak wyglądał wyścig w roku 2010, kiedy ponad 120 zespołów usiłowało dotrzeć do Stambułu w Turcji. Nie sądzę, bym był w stanie wziąć udział w tym roku, ale z pewnością jest to fajna sprawa. man, how could I write a post THAT long? Actually, I nearly quit blogging in 2010. I haven’t written a single blog post between November, 2009 and August, 2010. Why? First, I was quite busy during that period, especially between January and May, when I was preparing for my Matura exams. [it’s an exam you take in Poland after finishing high school, at the age of 19] More about Matura exams later in the post. Moreover, I haven’t had any ideas for my blog posts that had lasted until I went back online. I suspect it’s connected with the fact that I focused more on microblogging, as it suited me more then. To write a good blog post, you have to spend much more time than you spend writing a 140-character page on Twitter or Blip (I use both, the former is just a repeater of my „blips”, they’re mostly in Polish). Why did I return to blogging? Actually, I realized that I can’t fit every thought into 140 characters. It’s perfect for quick, live updates, but totally useless when you go to a place where you have no Internet access. January 2nd – I watched Avatar. I didn’t have tickets for the 3D version, so I guess I haven’t had a total experience, but it was one of the best films I’ve seen in 2010, although the plot didn’t surprise me at all. I won’t say it’s one of the best films ever, but it does leave an impression of a decent movie. January 10th – A day trip to Warsaw to the theatre. The play that was performed was an adaptation of „Romeo and Juliet”. We had to travel through half of Poland to get to Warsaw, and it was really difficult that day – it had been snowing for days before. It was the first time I had seen a car that was so damaged in a crash on the way to Warsaw. We’ve also seen a live concert for Wielka Orkiestra Swiatecznej Pomocy, a national annual fund-raising event. January 24th – The first time I heard a shortwave broadcast. It was China Radio International, broadcasting from Kashi in western China. I became more and more interested in shortwave during 2010, I’ve already received broadcasts from places as far as North Korea, Thailand and Taiwan. It was of my main hobbies during 2010 and it sure will be one in 2011. February 16th – my only day „in” the military. Not so long ago, authorities decided that the whole Polish army should turn professional, so I was one of the first that didn’t even have to avoid the draft. Actually, I had already stated that I won’t be called up when I was a little kid, so everything had to change ;] I had to take a day off from school to be categorized, though. It was an interesting experience, because I spent the whole day with people of all types. Some of them had already been convicted, and one was even a local rapper. The funniest thing, though, is the fact that I’ve been given the A category, which translates to something like „totally fit to join the army”, although I’m just ~165 cm high and I have ~46 kg of weight. Well, the ones that had already been convicted couldn’t get that category because of that, but I am sure they would be better soldiers than me… Somebody has to be the cannon fodder. February 19th – Feb 26th – a trip to Dortmund, Germany. It was much warmer in Germany than it was in Poland during that time period. Some impressions about local radio stations, a day trip to Venlo, Netherlands (really cheap coffee), buying Owl City single (he’s a blogger, woohoo! ), sending some postcards (they came to Poland faster than me! ), watching local beggars and thiefs, buying snuff tobacco for friends and for me (I gave away my snuff a few days ago, as I hadn’t even been using it more than two or three times), the possibility of my plane back home being diverted. March 5th – 3rd place in a voivodship [province] in an IT high school contest „Intersieć”, which translates as, well, „Interweb”. The quality of the contest isn’t great (sure it’d be better if I achieved such a place in a programming contest), but I qualified to the national phase, which was due to happen in Ruda Śląska in southern Poland. March 7th – my first 3D movie – Alice in Wonderland – I won’t say it was a pleasant experience. It seems I just don’t like 3D movies. I was also surprised that the technology doesn’t differ much from the one I’ve seen in comics when I was 6 years old. March 12th – I signed up at Facebook. I’m still there. March 13th – another contest, this time in Maths on my current university. I won an admission to Mathematics and Physics faculty at Gdańsk University of Technology, just like most of the participants (about 100). Didn’t have to use it, though. March 16th – a trip to Elbląg for another contest, this time in English. This time I intentionally failed, I thought there were too many contests in which I was taking part, given the Matura exams in just two months. March 25th – March 27th – a trip to Silesia for the national phase of „Intersieć” contest. One night in Katowice, another one in Częstochowa. There were two phases in Ruda Śląska, I didn’t qualify to the second. Overall, I got 18th place. As I had expected, the only prize I got was the diploma. I would’ve said it was a big waste of time and money, but expenses were covered by my school, and… actually, I like to travel. I had many opportunities to do bandscanning (scanning the radio band and noting which stations can be heard) and realized that I can pick up about three times as many radio stations in Silesia than in my area. March 28th – April 3rd – cooperating with Marcin (coding and art) and Monika (she insisted she didn’t help at all, because she’d only drawn one sprite), we were able to take part in game programming contest, in which we had to create a python game in 7 days. It was my second entry, this time the theme was „Wibbly-wobbly”, which was fairly hard. Our game wasn’t too interesting or innovative, so we finished 23rd (for 27 entries) in team entries. We were happy, though, that we managed to cooperate and create a functioning game in just 7 days. Game’s name is Maande. April 10th – the day of the plane crash in Smolensk, Russia, in which 96 Poles, including two Polish presidents, died. Although I’m not a supporter of President Kaczynski’s actions, I think it’s the event that should be remembered in a year’s summary. The following days brought only classical music (at least during the first 1-2 days) and toned down approach in all Polish radio stations. I’ve spent most of the national mourning period by reading Ryszard Kapuściński’s „The Emperor” for my Matura presentation. April 30th – I finished high school. I went to the same building every school day for almost 6 years (3 years secondary school, 2.75 years high school)! Got like 6 books from the teachers and board of directors for my achievements in that year. The whole event was one of the weirdest experiences I’ve had so far, as we all felt weird with the fact that it was the end of our education together. So well, is it time to begin my longest summer holidays? Not yet, the matura exams are still waiting. There’s even a small film from „artistic” part of our farewell event. May 4th – May 20th – Matura exams. I had 9 exams in total – 6 written: compulsory basic level Polish, English and Maths, and additional extended level Maths, Physics and English; and 3 oral: presentation in Polish about the Polish reportage, and two English exams. On the Physics exam I got a task from Mythbusters (the one with burning a ship using mirrors). I must say my exams went extremely well. I got: Polish 81%, English basic 99%, Maths basic 92%? [not sure already], Maths extended 84%, Physics extended 100% (woot! ), English extended 96%, and 100% in all oral exams. Basically, it was more than enough to get admitted to the university of my choice. June 1st – That day there was a special type of radio waves propagation – sporadic E – that gave me the opportunity to listen British radio stations on FM broadcast band. It was my furthest FM radio reception. June 11th – The biggest thunderstorm in 2010 in Tczew. I recorded it, and my video got quite popular in my area. June 18th – a concert of one of the most popular rock bands in Poland, Coma – in Tczew. June 21st – my first QSL (reception confirmation) card from KBS World Radio, based in South Korea. June 27th – I went to Nowe, Poland to watch the concert of one of Poland’s heavy metal dinosaurs – TSA. It wasn’t as fun as I expected, so we went back home after 45 minutes. The band playing as support (Revolucja) was better, though. June 29th – a day trip to Hel, Poland. It was incredibly hot and Japan lost in the World Cup. July 8th – July 12th – second trip to Dortmund, Germany this year – this time it was way too hot – the temperature went up to even 39 degrees. I watched third-place play-off and the final match here – Germany was 3rd, Netherlands 2nd. Guess, during which match it was louder on adjacent streets? Yes, you’re right – the final one. On my way back home (as always, in Wizzair plane) I had a free rollercoaster. Thanks, weather! July 20th – my first unpleasant encounter with regional trains’ company. 3 hours spent in the middle of nowhere, waiting inside the train for it to get its electricity supply back. Happens sometimes. July 26th – I listened to a Polish transmission of WYFR, one of the sects from the USA that says that the world will end in 2011. Ooops. August 1st – my first proper reception of North Korean radio station, Voice of Korea. I recorded it and uploaded the recording at Wrzuta. It starts around 2:00. I’ve even sent a reception report to the DPRK, but I was probably too curious about some technical things, so they didn’t bother to answer me at all. August 12th – I drew some „cross defenders” that were making a big fuss in Warsaw that summer. My only proper drawing this year. 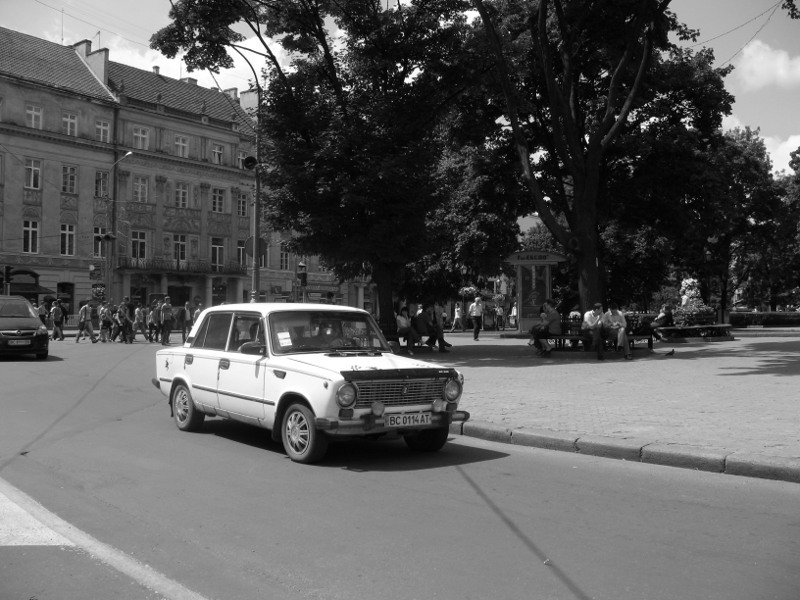 August 14th – 15th – A trip to Toruń and Bydgoszcz. We’ve seen the Old Towns of both cities, a controversial Catholic radio station, Radio Maryja and damped our feet in a river in Bydgoszcz. August 26th – another day trip to Hel. I was really shocked when I saw, how many people can fit into this small strip of land. Everybody wanted to use up their last days of summer vacation. I’ve had a month more. August 28th – Grzegorz Ciechowski’s Festival in Tczew. The main act was „Muchy” band, their song („Notoryczni Debiutanci”) will be the first I’m going to play in 2011. Why? Look at the post’s topic. September 1st – got SMS from both Taiwan and Bolivia during one day. The world feels really small. September 2nd – Sep 5th – I was a volunteer at international art festival – Zdarzenia – that took place in my hometown. I spent most of the time sitting at the front desk and explaining what’s happening, where it is, how to get there to both the audience and the artists (they were mostly speaking English, but I had to communicate with a guy speaking only in Czech once – our languages are similar, so it wasn’t too hard). Sometimes, the hosts tried to send me to some physical work, but I tried to stick to my duties. It was an interesting experience, but I’m still not sure, if it was in any way helpful for me. I must say that I felt like I was contributing to the community, though. I even answered some journalist’s questions for the local Web/cable TV station (6:50). September 18th – Sep 21st – one more trip to Dortmund, Germany. Well, plane tickets were cheap… That time I had no Internet access, so I wrote two blog posts (sorry, they’re in Polish). October 10th – my first digital television reception – at first from Kaliningrad Oblast, Russia. Wasn’t too good. October 15th – first reception of Polish digital TV. During 2 months, the number of available channels has grown from 2 to 11. October 30th – I watched „The Social Network”. The movie was particularly interesting for me, but overall it was too fast for an average viewer. They simply tried to fit in too much, which I liked, but surely not a casual viewer. I’d give it a third place in my watched movies ranking this year. November 20th – a day trip to Grudziądz and Malbork, using local trains. I described it pretty well on blog, however in Polish. December – snow, train delays, books, programming, Christmas. I realized that -15 degrees Celsius is not that low and that it is possible to travel in train standing with legs at an angle of 20 to 30 degrees from the normal vertical position. How? Ask Przewozy Regionalne (local train operator, they like to shorten the trains by half during the winter). December 19th – I baked my first bread. It was rather… flat. December 29th – watched „Citizen Kane” – even though the movie turns 70 this year, I think it was the best movie I’ve seen in 2010. I’ll have two semester exams this year – I hope to pass them without having to retake any of the exams. I hope that I will be able to spend this summer holidays travelling even more and further, as it’s probably one of the last years in which I’ll have three months of free time. It’s the last year, actually last 3,5 months of me being a teenager, yep, I’m turning 20 this year. Sounds scary. There is one more thing, that actually explains why I’ve put a post in English… I’ve decided to try to finish the challenge thrown up by WordPress guys – to write a blog post every week. And I thought – why not write in English, too? I don’t have English classes now, though it’ll change in a few months. Writing is a good way to refresh my English knowledge and – maybe – get some new subscribers. Don’t worry, other posts won’t be that long, I promise. Who knows, maybe I’d even write a post in German or Russian? Especially the latter one would be hard, as I haven’t really learned that language. rany, jak mogłem napisać TAK długiego posta? Mało brakowało, a kompletnie zakończyłbym moje blogowanie w 2010 roku. Nie napisałem żadnego posta pomiędzy listopadem 2009 r., a sierpniem 2010 r. Czemu? Po pierwsze, byłem raczej zajęty w tym czasie, zwłaszcza pomiędzy styczniem i majem, gdy przygotowywałem się do matury. Więcej o tym dalej w poście. Poza tym, nie miałem żadnych pomysłów na posty na blogu, które przetrwałyby do mojego powrotu do komputera. Podejrzewam, że jest to związane z tym, że skupiłem się bardziej na mikroblogowaniu, co bardziej mi wtedy pasowało. By napisać dobrego posta na bloga, trzeba spędzić dużo więcej czasu, niż na pisaniu 140-znakowego statusu na Twitterze czy Blipie. Czemu powróciłem do blogowania? Zorientowałem się, że nie zawsze mogę zmieścić się w 140 znakach. Mikroblogi są świetne do szybkiego informowania na żywo, lecz totalnie nieprzydatne, gdy udajesz się gdzieś, gdzie nie masz dostępu do Internetu. 2.01 – obejrzałem Avatara. Nie miałem biletów na wersję 3D, więc podejrzewam, ze moje doświadczenie nie było kompletne, ale to był jeden z najlepszych filmów, jakie widziałem w 2010 roku, pomimo że rozwój wydarzeń kompletnie mnie nie zaskoczył. Nie powiedziałbym, że jest to jeden z najlepszych filmów w historii, ale pozostawia po sobie wrażenie porzadnego filmu. 10.01 – jednodniowa wycieczka do Warszawy do teatru. Obejrzeliśmy adaptację „Romea i Julii”. Musieliśmy przejechać pół Polski, by dotrzeć do Warszawy, a to było tego dnia wyjątkowo trudne – przez wiele dni wcześniej padał śnieg. Po raz pierwszy widziałem tak zmasakrowane auto po drodze do Warszawy. Trafiliśmy też na koncert na żywo dla Wielkiej Orkiestry Świątecznej Pomocy. 24.01 – Pierwszy raz usłyszałem transmisję na falach krótkich. Było to Chińskie Radio Międzynarodowe, nadające z Kashi w zachodnich Chinach. Przez cały rok 2010 coraz bardziej wciągały mnie fale krótkie, do tej pory odebrałem już transmisje z miejsc tak dalekich, jak Korea Płn, Tajwan, czy Tajlandia. Było to jedno z moich głównych hobby w 2010 i z pewnością będzie takim w 2011. 16.02 – mój jedyny dzień „w” wojsku. Jestem z jednego z pierwszych roczników, które ominął pobór do wojska, więc nawet nie musiałem go unikać. Gdy byłem mały, i tak zadeklarowałem, że nigdy do wojska nie pójde, więc przepisy musiały się zmienić ;] Musiałem jednak zrobić sobie dzień wolny od szkoły, by dostać kategorię. Było to dość ciekawe doświadczenie, bo spędziłem cały dzień z ludźmi stanowiącymi w zasadzie cały przekrój społeczeństwa. Niektórzy z nich już mieli na koncie wyroki, a jeden był nawet lokalnym raperem. Najzabawniejszy jest jednak fakt, że dostałem kategorię A, czyli całkowicie zdolny do służby wojskowej, pomimo, że mam jedynie około 165 cm wzrostu i 46 kg wagi. Cóż, ci, którzy mieli wyroki, nie mogli dostać A właśnie z tego powodu, ale jestem pewien, że byliby lepszymi żołnierzami ode mnie… Ktoś jednak musi być mięsem armatnim. 19.02-26.02 – wycieczka do Dortmundu w Niemczech. Było tam znacznie cieplej, niż w tym czasie w Polsce. Wrażenia związane z lokalnymi stacjami radiowymi, jednodniowy wypad do Venlo w Holandii (naprawdę tania kawa), kupowanie singla Owl City (juhu, on jest blogerem! ), wysyłanie paru pocztówek (dotarły do Polski szybciej niż ja! ), obserwowanie lokalnych żebraków i złodziei, kupowanie tabaki dla przyjaciół i dla mnie (moją oddałem parę dni temu – nie używałem jej więcej niż 2 albo 3 razy), możliwość przekierowania mojego samolotu na inne lotnisko. 05.03 – 3 miejsce w województwie w informatycznym konkursie „Intersieć”. Jego poziom nie jest najwyższy (z pewnością byłoby lepiej uzyskać takie miejsce w konkursie programistycznym), ale dostałem się do etapu krajowego, który miał odbyć się w Rudzie Śląskiej. 07.03 – Mój pierwszy film 3D – Alicja w Krainie Czarów – nie powiem, by było to przyjemne doświadczenie. Wygląda na to, że po prostu nie lubię filmów 3D. Byłem też zaskoczony, że technologia nie różni się zbytnio od tej, którą widziałem w komiksach, gdy miałem 6 lat. 12.03 – zarejestrowałem się na Facebooku. Nadal tam jestem. 13.03 – kolejny konkurs, tym razem z matematyki na mojej obecnej uczelni wyższej. Wygrałem indeks na Wydział Matematyki i Fizyki Technicznej na Politechnice Gdańskiej, podobnie jak większość uczestników (około 100). Nie musiałem jednak go uzywać. 16.03 – wycieczka do Elbląga na kolejny konkurs, tym razem z angielskiego. Celowo położyłem go, bo stwierdziłem, że biorę udział w zbyt dużej liczbie konkursów, biorąc pod uwagę zbliżającą się maturę – już za 2 miesiące. 25.03-27.03 – wycieczka na Śląsk na etap krajowy konkursu Intersieć. Jedna noc w Katowicach, druga w Częstochowie. W Rudzie Śląskiej odbyły się dwa etapy konkursu, nie dostałem się do drugiego. Ostatecznie, miałem 18. miejsce. Tak, jak się spodziewałem, jedyną nagrodą był dyplom. Powiedziałbym, że było to duże marnotrawstwo pieniędzy i czasu, ale wydatki były pokrywane przez szkołę, i… w zasadzie, lubię podróżować. Miałem wiele możliwości robienia bandscanów (przeglądania eteru radiowego i notowania, które stacje mogę usłyszeć) i zorientowałem się, że mogę tu odebrać około 3 razy więcej stacji, niż u mnie. 28.03-03.04 – we współpracy z Marcinem (programowanie, rysunki) i Moniką (upierała się przy tym, że wcale nie pomogła, bo narysowała jeden rysunek), mieliśmy okazję wziąć udział w konkursie na stworzenie gry w Pythonie w 7 dni. To był mój drugi start, tym razem tematem było „Wibbly-wobbly”, co było dość ciężkie (mam nawet problem z tego przetłumaczeniem). Nasza gra nie była zbyt interesująca czy innowacyjna, więc zajęliśmy 23 (na 27) miejsce w kategorii zespołów. Byliśmy jednak zadowoleni, że udało nam się współpracować i stworzyć działającą grę w jedyne 7 dni. Jej nazwa to Maande. 10.04 – dzień katastrofy lotniczej w Smoleńsku, w której zginęło 96 Polaków, w tym dwóch Polskich prezydentów. Co prawda nie popieram działań prezydenta Kaczyńskiego, ale sądzę, że to wydarzenie powinno być wspomniane w rocznym podsumowaniu. Następne dni przyniosły głównie klasyczną muzykę i znaczne uspokojenie wszystkich polskich stacji radiowych. Większość żałoby narodowej spędziłem, czytając „Cesarza” Kapuścińskiego. 30.04 – Ukończyłem liceum. Chodziłem do tego samego budynku każdego dnia szkoły przez prawie 6 lat (3 lata gimnazjum, 2.75 roku liceum)! Dostałem chyba 6 książek od nauczycieli i dyrekcji za moje osiągnięcia w tym roku. Całe wydarzenie było jednym z dziwniejszych doświadczeń, jakie dotąd miałem, wszyscy czuliśmy się dziwnie z tym, że to koniec naszej wspólnej edukacji. Więc pora na rozpoczęcie moich najdłuższych letnich wakacji? Jeszcze nie, nadal czekają maturalne egzaminy. Jest nawet filmik z „artystycznej” części naszego pożegnalnego spotkania. 04.05-20.05 – matury. Opisałem je już po polsku jakiś czas temu, a jest 4 w nocy, więc odpuszczę sobie tłumaczenie tego fragmentu. 01.06 – tego dnia miała miejsce propagacja radiowa typu Sporadic E, która dała mi możliwość posłuchania brytyjskiego radia na FM. To był mój najdalszy radioodbiór FM. 11.06 – największa burza roku w Tczewie. Nagrałem ją, a moje wideo stało się całkiem popularne w mojej okolicy. 18.06 – koncert Comy w Tczewie. 21.06 – mój pierwszy QSL (potwierdzenie radioodbioru) od KBS World Radio, stacji z Południowej Korei. 27.06 – Pojechałem do Nowego na koncert jednego z dinozaurów polskiego metalu – TSA. Nie było tak fajnie, jak się spodziewałem, więc po 45 min ich koncertu pojechaliśmy z powrotem do domu. Support (Revolucja) był jednak lepszy. 29.06 – jednodniowa wycieczka na Hel. Było strasznie gorąco, a Japonia przegrała w Mistrzostwach Świata. 08.07 – 12.07 – drugi wyjazd do Dortmundu. Tym razem było zdecydowanie zbyt ciepło – temperatura sięgała nawet 39 stopni. Obejrzałem tam mecz o trzecie miejsce i finał – Niemcy były trzecie, Holandia druga. Zgadnijcie, w czasie którego meczu było głośniej na pobliskich ulicach? Tak, macie racje – w trakcie finału. W drodze z powrotem do domu (jak zawsze, w samolocie Wizzair) miałem darmową kolejkę górską. Dzięki, pogodo! 20.07 – moje pierwsze nieprzyjemne zetknięcie z Przewozami Regionalnymi. 3 godziny w szczerym polu, czekając, aż do pociągu wróci napięcie. Bywa. 26.07 – słuchałem polskiej audycji WYFR, jednej z sekt z USA, która twierdzi, że koniec świata nastąpi w 2011. Ups. 01.08 – mój pierwszy porządny odbiór północnokoreańskiej stacji radiowej, Voice of Korea. Nagrałem i wrzuciłem to na Wrzutę. Zaczyna się ok. 2:00. Nawet wysłałem im do Korei Płn raport odbioru, ale wygląda na to, że byłem zbyt ciekawski w sprawach technicznych, więc nie pofatygowali się mi w ogóle odpowiedzieć. 12.08 – Narysowałem paru „obrońców krzyża”, którzy robili zamieszanie w Warszawie tego lata. Mój jedyny porzadny rysunek w tym roku. 14.08-15.08 – wycieczka do Torunia i Bydgoszczy. Widzieliśmy Stare Miasto w obu miastach, siedzibę Radia Maryja, pomoczyliśmy też nogi w rzece w Bydgoszczy. 26.08 – kolejna jednodniówka na Hel. Byłem naprawdę w szoku, gdy zobaczyłem, jak wielu ludzi może zmieścić się na tym małym kawałku ziemi. Wszyscy chcieli wykorzystać ostatnie dni wakacji. Ja miałem jeszcze miesiąc. 28.08 – Festiwal Ciechowskiego w Tczewie. Gwiazdą był zespół „Muchy”, których piosenkę „Notoryczni Debiutanci” puszczę jako pierwszą w tym roku. Czemu? Spójrz na tytuł posta. 01.09 – dostałem SMSy z Tajwanu i Boliwii jednego dnia. Świat staje się naprawdę mały. 02.09-05.09 – byłem wolontariuszem na międzynarodowym festiwalu sztuki – Zdarzeniach – który miał miejsce w moim mieście. Spędziłem większość czasu wiedząc w recepcji i wyjaśniając, co się dzieje, gdzie to jest, jak tam dotrzeć zarówno widzom, jak i artystom (zazwyczaj mówili po angielsku, ale raz musiałem porozumieć się z facetem mówiącym po czesku). Czasem próbowano wysłać mnie do pracy fizycznej, ale starałem się trzymać moich obowiązków. Było to dość interesujące doświadczenie, ale wciąż nie jestem pewien, czy pomocne mi w jakikolwiek sposób. Muszę jednak przyznać, że czułem się, jakbym dawał mój wkład w społeczność. Nawet udzieliłem krótkiego wywiadu lokalnej TV Tczew (6:50). 18.09 – 21.09 – jeszcze jeden wyjazd do Dortmundu. Cóż, bilety lotnicze były tanie… Tym razem nie miałem dostępu do Internetu, więc napisałem dwa posty. 10.10 – mój pierwszy odbiór telewizji cyfrowej, z Kaliningradu. Nie był najlepszy. 15.10 – pierwszy odbiór polskiej telewizji cyfrowej. W 2 miesiące, liczba kanałów wzrosła z 2 do 11. 30.10 – obejrzałem „The Social Network”. Film był interesujący zwłaszcza dla mnie, ale ogólnie był zbyt szybki dla przeciętnego widza. Próbowano tam po prostu zmieścić zbyt dużo, co mi pasowało, ale z pewnością nie zwykłemu widzowi. Dałbym mu trzecie miejsce w moim rankingu obejrzanych w tym roku filmów. Grudzień – śnieg, opóźnienia pociągów, książki, programowanie, Święta. Przekonałem sie, że -15 stopni Celsjusza to wcale nie tak mało, a także, że możliwe jest podróżowanie pociągiem w pozycji stojącej pomimo nóg odchylonych pod kątem 20-30 stopni od pionu. Jak? Zapytajcie Przewozów Regionalnych (lubią skracać w zimie pociągi o połowę). 19.12 – Upiekłem mój pierwszy chleb. Wyszedł raczej… płaski. 29.12 – obejrzałem „Obywatela Kane”. Pomimo, że film w tym roku skończy 70 lat, uważam go za najlepszy, jaki obejrzałem w 2010 roku. 2x sesja w tym roku – mam nadzieję, że zdam bez poprawek. Mam nadzieję, że będę w stanie w te wakacje podróżować jeszcze więcej i dalej, jako że to zapewne ostatnie lata, w których mam 3 miesiące wolnego czasu. To ostatni rok, a w zasadzie ostatnie 3,5 miesiąca mojego bycia nastolatkiem. Taa, kończę w tym roku 20 lat. Brzmi groźnie. I jeszcze jedna rzecz, która wyjaśnia, skąd tu się wziął post po angielsku… Zdecydowałem się spróbować wziąć udział w wyzwaniu rzuconym przez ludzi z WordPressa – by pisać posta na bloga co tydzień. Pomyślałem też – czemu by od razu nie pisać też po angielsku? Nie mam w tej chwili lekcji angielskiego, ale to akurat zmieni się za parę miesięcy. Pisanie jest dobrym sposobem na odświeżenie mojej wiedzy z angielskiego i – może – zdobycie nowych czytelników. Nie martwcie się, obiecuję, że następne posty nie będą tak długie. Kto wie, może nawet napiszę posta po niemiecku albo rosyjsku? Zwłaszcza to drugie byłoby trudne – w zasadzie nigdy nie uczyłem się tego języka.